Just completed: a new sports mascot logo design and illustration done for the Bancroft Bulldogs, a private school located in Boston, Massachusetts. Bancroft School's ad agency, the Kor Group reached out to me about working with them on this fun and challenging project for the school's middle and high school students' sports program. They had seen some of my other sports work and wanted to create something bold, unique and tough to go with their chosen mascot, the bulldog. 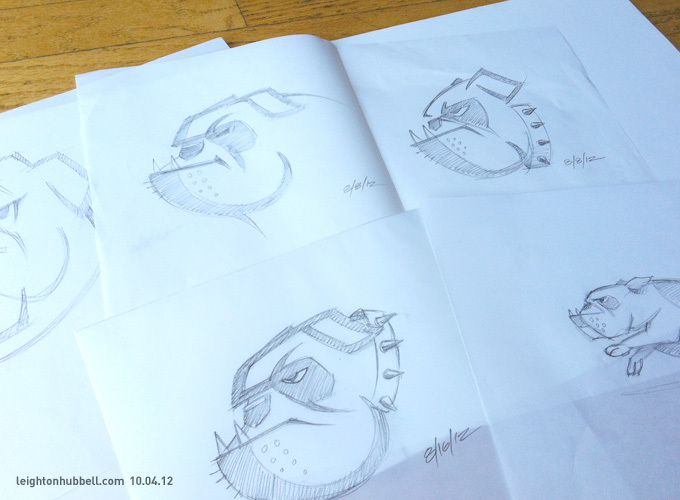 Well, the 'tough' thing about designing a bulldog mascot is, well it's been done – a lot. In fact, my biggest fear working on this project was treading on previously covered ground and having to start completely over. So, I thought the best tact to follow was to start sketching and see what comes up. After drafting up a few directions I would check my usual sources to see if we had something different enough to stand on its own, and go from there. Here are some initial thoughts on poses and profiles. 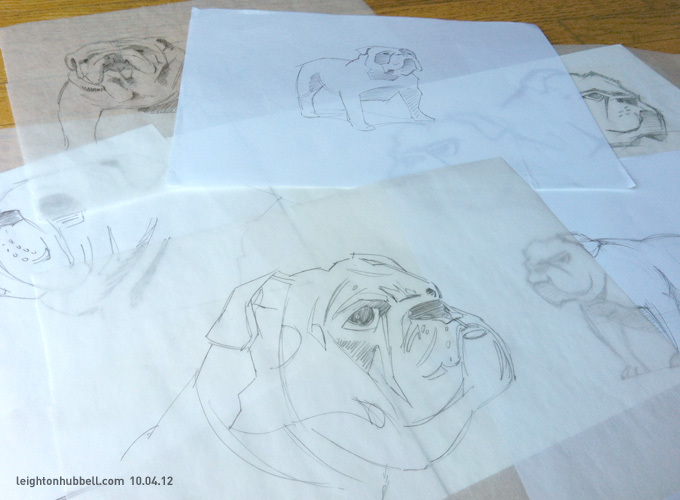 After those loose sketches, I worked up some stylizations of the poses and tried some variations on graphic approaches to the bulldog. So, I sent these sketches over to the agency and got their feedback on the directions. Upon some review, I got some suggestions on which designs to focus on. I must say, I did quite a few sketches with dozens of refinements and variations to finally arrive at concepts I was happy with. Finally, when the concept (that would eventually be the final design) came along, I think we all agreed that that was the one. What a relief! 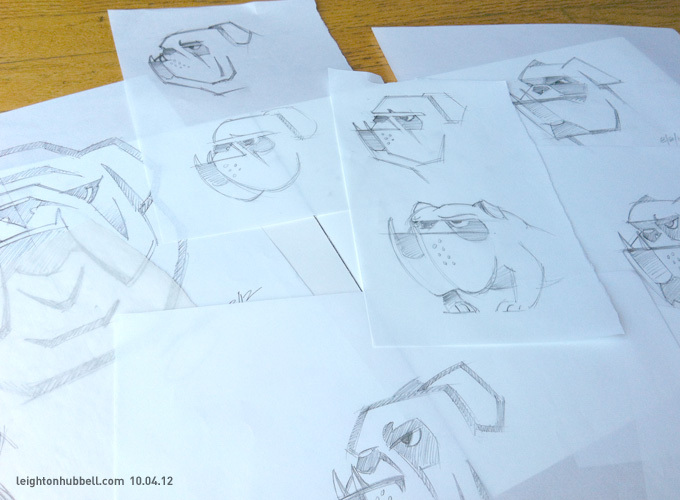 The next step was figuring out how the bulldog's head would be integrated into a completed logo. And then finally, the rather clean version of bulldog and angled, bold type would prevail as the final selection. As a regular practice, I try to apply the completed logo on to assorted clothing and athletic equipment so everyone can see how it will look in real world applications. I hope you like the work. Special thanks to Bancroft School and Kor Group for the project. 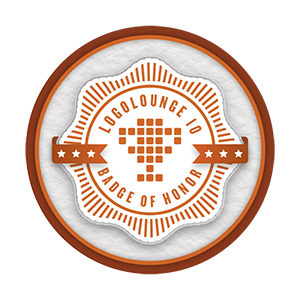 As an added bonus, I created a time lapse video of how the logo was rendered in Adobe Illustrator. It's roughly 4 hours of vector rendering time compressed into 3 minutes – all done from the approved pencil sketch. Enjoy.